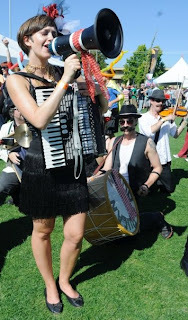 MISS NATASHA ENQUIST: ELECTRO-ACCORDION CHANTEUSE: Fun times playing at Beerfest! Fun times playing at Beerfest! I had a blast at the Great Canadian Beer Festival this past weekend here in Victoria BC. Ran into lots of friends, made new ones, avoided a lot of drunk grabby hands, tried lots of yummy beers, and played my heart out. :) My favourite beers that I sampled were a chocolate stout from Phillips Brewing Company, LOVE YOU PHILLIPS! And then a Pumpkin ale, from Seattle...I think... can't really be too sure. Needless to say, it was a fun weekend!